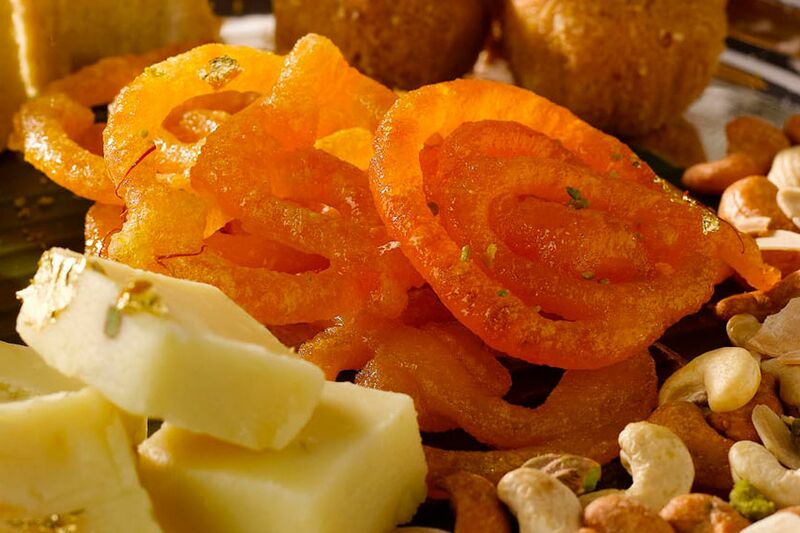 With less than three weeks to go to Deepavali on Nov 10, hotels and restaurants are trotting out sugary Indian treats known as mithai. The sweets - eaten as snacks and desserts - are given to friends and family during Deepavali as a symbol of good luck and prosperity. They are made with an array of ingredients that include sugar, different flours, Indian spices and fruit. Restaurants and hotels also jazz up these dainty delights in fancy boxes. Shahi Maharani owner Chitra Mirpuri, and Tiffin Room chef de cuisine Kuldeep Negi talk about Deepavali sweets. 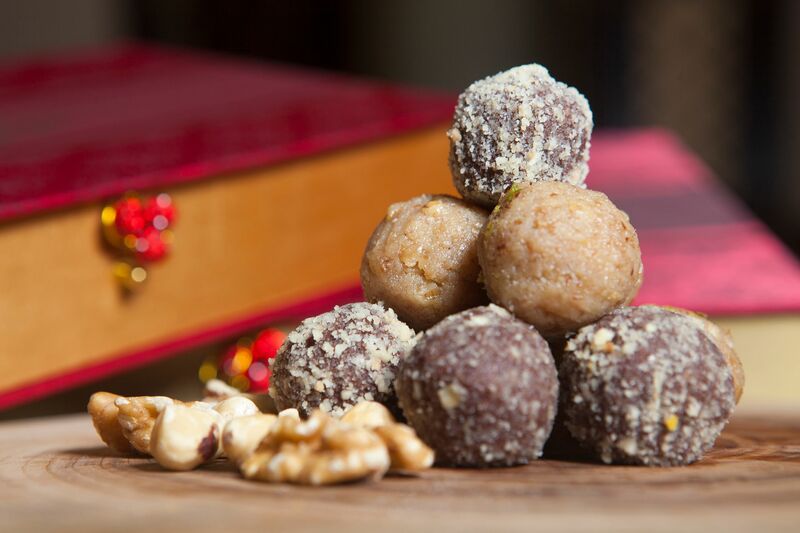 What: Ball-shaped sweets made of flour, sugar and a variety of flavours cooked in ghee. Flours commonly used include chickpea, rava (wheat semolina) and ground coconut. Another popular item is motichoor ladoo, made from sweetened, fried chickpea flour. 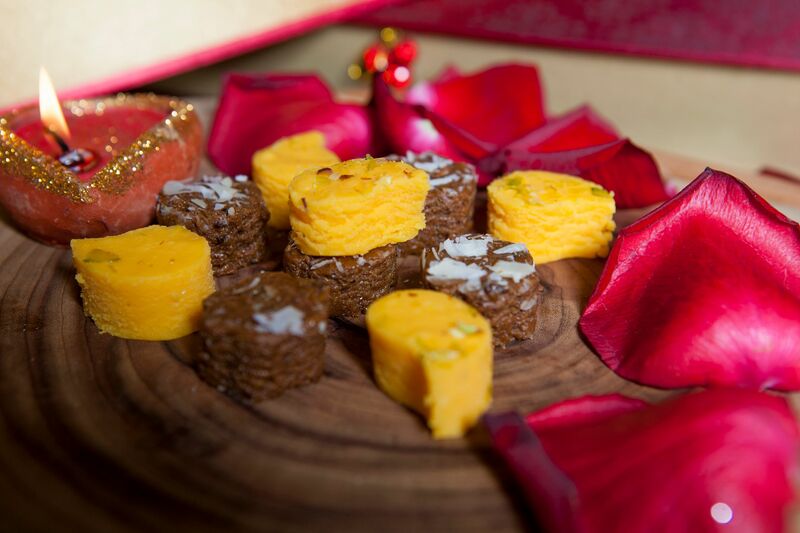 What: Popular variations of this mithai include besan burfi, which is made with chickpea flour, pure ghee and pure cane sugar. Normally garnished with chopped nuts such as pistachio. Nuts such as cashews and almonds can also be chopped and cooked together with the dough. Burfi can also be milk-based, or made with dried rose petals. What: In Hindi, Kaju means cashew nut. The rolls are made by grinding the nuts finely and adding them to sugar syrup. It is cooked over a low flame until a soft dough is formed. The stuffing is made with ground pistachio. A small amount of ghee is added to make the dough more pliable. 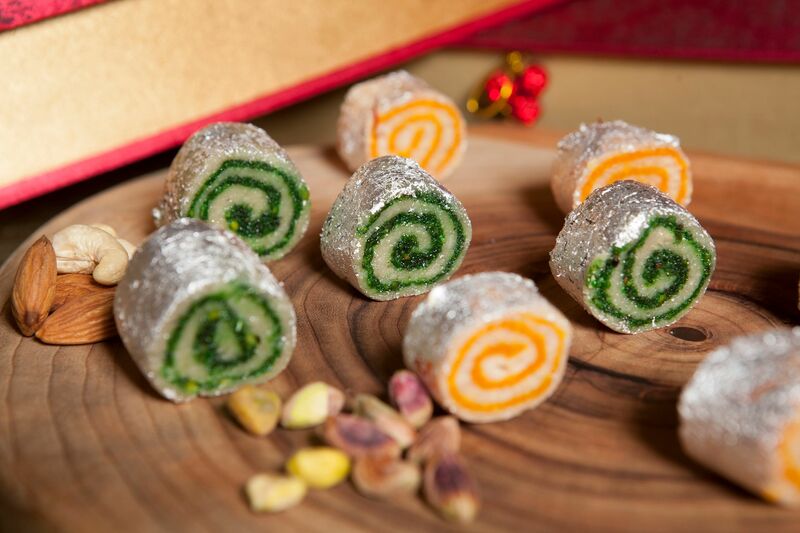 The pistachio can be used as a filling for the cashew dough, or placed in layers to look like a Swiss roll. Silver leaf is rolled over the entire surface of the roll. What: In Hindi, ras means "juice", and malai means "cream". These soft milk dumplings are cooked in a sugar syrup with saffron-infused milk. What: A milk-based dessert, commonly made with milk solids (also known as khoya, a dairy produce made with dried whole milk or milk thickened by heating milk on a low flame). The milk solids are made into a dough, fried and then soaked in sugar syrup. Chefs are also spicing up the offerings with new flavours, and making mithai less sweet to cater to the local palate. A new addition to Shahi Maharani North Indian Restaurant's mithai selection (from $28+ for 12 pieces, Raffles City Shopping Centre, 03-21B, tel: 6235-8840, www.shahimaharani.com) is dark chocolate and hazelnut ladoo, while Tiffin Room (Raffles Singapore, tel: 6412-1816, available from Nov 7 to 10 for Deepavali buffet lunch, $68++, and dinner, $78++) features egg pak, which is made with egg yolk, rosewater, cardamom powder and almond cream, among other favourites. Over at Rang Mahal (Pan Pacific Singapore, Level 3, tel: 6333-1788), two new flavours have been in the works since January. They are lychee; and black sesame and gram, or chickpea, flour (from $53.50 for 12 pieces). Rang Mahal's restaurant manager Suryapal Singh Negi, 35, says: "We have diners who request more healthy variations and unique flavours. We used black sesame since it is believed to have antioxidants and help in lowering cholesterol levels." And while business is brisk at hotels and restaurants, prices are on the rise because of the increase in the cost of raw ingredients. The luxe design of mithai boxes adds to the cost. Shahi Maharani owner Chitra Mirpuri, 39, says: "The price of the silver leaf we use for our kaju roll has more than doubled in the past few years and prices increase during Deepavali due to demand. Our cashew powder from Indonesia has increased in price by 15 per cent." Yet with the introduction of new items, traditional mithai still makes up the bulk of sweets available on restaurant menus. At The Song Of India in Scotts Road, sales has been increasing by 30 to 40 per cent every year, for its handcrafted sweets (from $48+). Signature items include Mango Magnifique, made with pure alphonso mango puree; Rose Royale, using rose gulkand (rose petal preserve) imported from Lucknow, India, and Diamante Delight, with figs from Iran. Others are also putting a creative spin on the ingredients commonly used in creating mithai. Inspired by popular ingredients such as cardamom, mango and pistachio, chocolatier Anjali Gupta has come up with a collection of chocolates called AnjaliChocolat (buy online at www.anjalichocolat.com, or 01-15/16, 73 Loewen Road) in embellished boxes ($56 for 16 pieces, $31.50 for nine pieces). Over at 462 Crawford Lane, And All Things Delicious bakery's (andallthingsdelicious.com, tel: 6291-4252) owner Dewi Imelda Wadhwa has created a nine-inch pistachio cardamom cake ($52) topped with Swiss meringue vanilla buttercream.